Buy, Rent or Skip Good Night, and Good Luck.? With Neumatic's glowing praise for George Clooney's direction for Confessions of a Dangerous Mind, a sentiment that I agree with 100%, it propelled me to want to check out his followup in the director's chair, one that I just never got around to seeing, but one that I've heard nothing but great things about. I of course am referring to Good Night, and Good Luck. The story itself is waaaaay before my time. I know as much as anyone else that had to study History in High School and College and the documentaries I've seen over the years. But I just never could connect to the subject matter in a way that it should be, given the huge divide it brought onto the American people. But what Clooney does with this film is nothing short of perfection. It's a brilliant piece of film making, one that he should be extremely proud of. I just wish this movie in particular existed when I was in High School when we had to devote time to Joseph McCarthy and his Anti-Communist crusade. The movie really brings to light exactly what it was like back in the day and the terror they felt, waiting for the shoe to drop when McCarthy would retaliate. 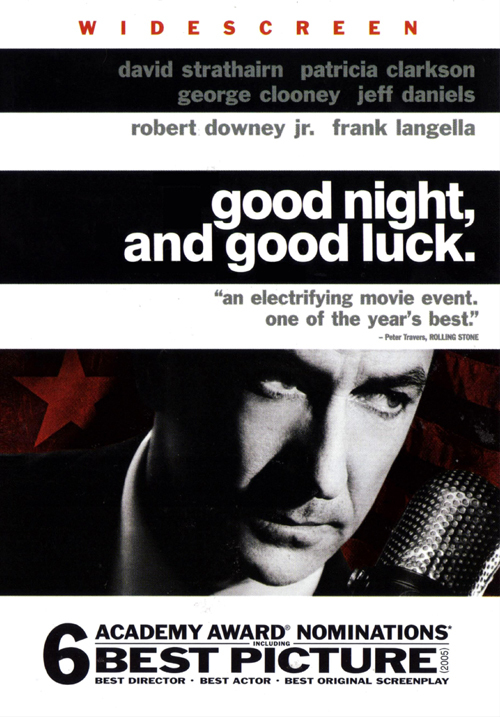 As I said, Clooney was great and deserved to get nominated for Best Picture, Best Director and Best Original Screenplay, but it's David Strathairn as Edward R. Murrow that steals the movie. He is phenomenal here and definitely earned his Best Actor nomination. An outstanding cast that also includes Robert Downey Jr., Patricia Clarkson, Frank Langella, Jeff Daniels, Tate Donovan, Reed Diamond, Ray Wise and of course George Clooney. I highly recommend this as a Rent. It will give you a great inside look into a big part of American past. 5 Stars out of 5. How would you describe George Clooney's style, I wonder? Not sure how to describe what his style is. As it stands now, I've only seen two of his films in which he directs. Definitely a throwback to old school. I really like the way Good Night is lit and shot. Whether he deferred to the Cinematographer or not...it looks great. There's definitely an old-school feel to it, but I think that's more dictated by the script... Good Night and Confessions both have differing styles so it's hard to figure out what they have in common. You know what I think it is... I was going to say that they're movies wearing suits, but I think the style of the movie is the style of the wardrobe the lead character is wearing: The fifties were proper and button down and ironed and that's sort of the feel of the movie, sharp, crisp, everyday elegance, and Confessions... in the "younger' days was a little more faded, it's the same suit you wear every day until you can afford a nicer suit with real material, then gets dressier when Chuck gets more money, and when he's at his lowest level, it's dirty. And reality keeps unfolding around him... in Good Night reality is consitent, a freshly-done tie, and in Confessions it's loose and hanging and a little off-kilter and that's when you walk from one scene to another or do analog split-screens.